It must be spring. The sounds of garden equipment on Saturday mornings and folks standing in lines at local nurseries. And as yards are greening up and new plant growth is seen everywhere, the bare spots from last year’s failures and winter’s destructive nature seem to stick out like a sore thumb. Here are a few tips on how to use ground cover to cover bare spots in your yard. (ARA) – Nearly every lawn or garden has one – a bare, ugly spot where nothing seems to grow well. Maybe the spot gets too much sun, or too much shade. Perhaps the soil is too sandy, rocky or full of clay for most plants to survive in it. Maybe it’s on a hill or slope where exposure to wind and water runoff make it uninhabitable for average plant life. Whichever one (or more) of these challenges is the source of your problem spot, chances are the cure is pretty universal: cover it up … quickly, inexpensively and permanently with flowering or lush, green ground cover. A variety of ground covers. Hardy, easy to grow and aesthetically appealing ground cover fills vacant spaces, solves landscaping trouble spots and minimizes garden maintenance. Ground cover can transform a dull, sparse space into a rich tapestry of textures, shapes and continual color. These plants can spruce up challenging spots under trees, accent transitional areas along paths and foundations, and intensify interest in open spaces. Plus, they deliver a stunning seasonal show of flowers and colors. 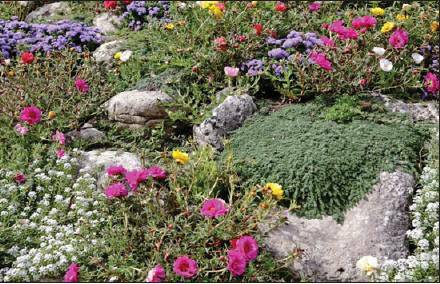 Ground cover is a cost-effective, fast way to deal with difficult trouble spots. It performs the job of mulch at a fraction of the cost, blocking weed growth, insulating soil, protecting more fragile plants and adding visual appeal. Some ground covers even bolster nutrients for companion plants with more demanding nutritional needs. * Don’t just plant the first ground cover that catches your eye. First, take stock of your problem area so you can select a ground cover that is appropriate for the spot. Some ground covers need sun, while others thrive only in shade. Some prefer dry locations. Others require moist soil. * Assess the soil at the site. Is it sandy and dry? A lovely loam? Or wet, soggy clay? There’s a ground cover for every soil condition, but you’ll also need to test the acidity level of the soil. You may need to amend your soil to raise or lower its pH content, or add organic matter to modify its texture. * Hardy as they are, ground covers still require proper fertilizing, watering and weed control to maintain their attractiveness – just like any other plant. Newly planted areas will need special attention until they’re well established. * Seed is the least expensive way to start ground cover. And planting ground cover seeds is some of the easiest sowing you’ll ever do in your yard or garden. Ground cover seeds are typically much smaller and lighter than other plant seeds; often you’ll get as many as 175,000 seeds in just 1 ounce. One way to make sowing even easier is to use a pre-mix of seeds and lime, like those offered by Outsidepride.com. The mix comes in a shaker bottle and you simply sprinkle the seeds on the planting site. The lime in the mix improves the pH of acidic soils, adds valuable micronutrients and helps break down organic matter. The lime is also white, so it’s easy to tell where you’ve spread the seed. You can find a ground cover for virtually every soil situation – and to suit every landscaping preference. Outsidepride.com offers more than 50 different types of ground cover seed, from the luminous lavender and red of Magic Carpet creeping thyme and the baby blue of Forget-Me-Not to the gorgeous greens of Irish Moss and Kenilworth Ivy. Best-sellers like creeping thyme offer homeowners a vibrant, versatile way to solve problems and accent their landscaping. Creeping thyme is a favorite for its tolerance of dry soil, low maintenance needs and ability to self-seed season after season. To get ground covers started off on the right foot, plant them in spring so they have a chance to root well. Before long, your barren, weedy trouble spots will be gone, covered by wondrous waves of flowers and foliage. Succulents can make great ground covers! 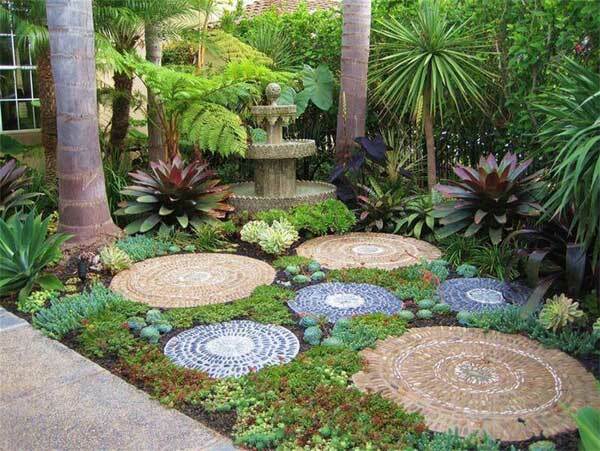 Love the round mosaic ground cover. Where can u purchase? There are actually a few spots in my yard that could use ground cover. I’ve been having trouble trying to decide what to do to make those spots look presentable. I love flowers and think they’re a good idea but I don’t know if they would stay fresh. Maybe I could do a combination of rock and floral decorations. A combination of a few football size boulders, along with some 2″ river rock, mixed with some local low growing flowers and a few succulents might just do the trick. I hope this gives you more ideas. Thanks for the advice. We have an area in the back of our house that is bare and allows a vast amount of water to run under our house during heavy rains. Grass won’t grow in the area, which is partly shaded and hard ground. The runoff has caused mold/mildew under the house and we are looking at alternatives means to correcting the problem. The slope is partially covered with Bermuda grass (as is the entire yard) and is a 3-4 degree incline. The bare area is almost 20 feet on length and 6 feet in width. Location is upstate South Carolina. What would be the best ground cover to correct this problem? Before getting to the ground cover, I would put some thought into diverting the water from going under the house. I’m not sure if you mean that the water is rushing down the 20 foot length or travelling across the 6 foot width. Possibly a low berm along the house to re-route the water. Or maybe a french drain at the bottom of the slope to collect the excess water and move it around the house. Yo have to divert the water if you want to get rid of the mold and mildew. If the soil is hard packed, you will need till it lightly, turning in some good organic matter. Once the soil has the ability to let plants roots grow, and you slow down the water erosion, you be surprised at how many shade loving plants you could try to grow. I’m sure that our local nurseryman can point you to some local favorites that will work well in your area. Hostas, Impatiens, Heuchera, Begonia, Astilbe, and the Copper Plant. We recently did a post on Leopard Plants. They enjoy the shade and like lots of water. Again, contact a local nursery and ask them about rain gardens in your area. They are becoming more and more popular around here because our regular daily summer downpours. Another source of local information would be you county extension service. They usually have lots of information concerning gardener’s needs, with suggestions that will work in your neighborhood. Thanks for asking and please let us know the path you take towards solving this problem.